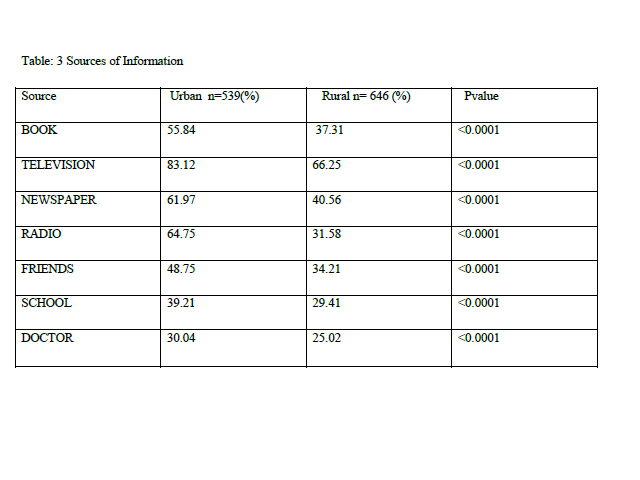 International Journal of Research in Health Sciences,2014,2,1,182-189. 1-Associate professor, 2-Junior Resident, Department of of Paediatrics, Rajarajeshwari Medical College and Hospital, kengeri, Bangalore , INDIA. Background: Knowledge about the spread of HIV and safe sexual practices has a critical impact on the prevention of the acquired immunodeficiency syndrome (AIDS).We assessed the knowledge of and attitude towards AIDS ,sexually transmitted diseases among , boys & girls, rural & urban high school students in Bangalore district ,Karnataka. Methods: We performed a cross-sectional survey of 1185 randomly selected high school students (rural 646 ,urban 539 ,age 12- 18yrs).We administered a pre-tested, structured questionnaire to assess the knowledge and attitude of the students towards HIV , AIDS & STDs. The questionnaire were collected back , data was tabulated , analyzed using SPSS 16.0 data version and inferences drawn based on statistical findings. Results: Majority (80%) of students in our sample heard about AIDS .However 84% of students knew about transmission of HIV/ AIDS.63% of them knew about condoms. 56% of them knew that using condoms prevents HIV/AIDS. Only 2% of them knew about gonorrhea and syphilis. Boys and urban residents demonstrated a higher knowledge and favorable attitude towards HIV and AIDS than girls and rural residents. Conclusions: Our study identified substantial lacunae in the knowledge of and attitude towards HIV, AIDS and STDs among high school students in Bangalore. The gap in knowledge between boys and girls, and between rural and urban students suggests the need for targeting girls and rural areas in the national AIDS education and awareness campaigns.